The more I have Thai food, the better I like it. 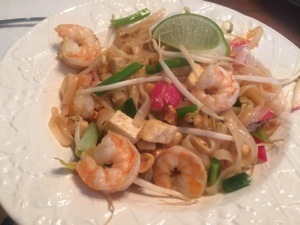 Like so many Americans, my first entry into the cuisine was Pad Thai. Because of that, I’ve made three or four different recipes for the dish with each having its own advantages. This one, while still containing a number of ingredients, is actually one of the easier ones to make because all of the ingredients were easily found in my local mass market grocery store. The combination of noodles, sauce and fresh vegetables makes this dish a winner. For some reason those bean sprouts are the hardest to find! A huge platter to serve a hungry family! Soak the noodles in a bowl of warm water until soft enough to separate, about 10 minutes. Mix the fish sauce, sugar, chili sauce and lime juice in a separate bowl. When the noodles are soft, drain and return to the bowl. Put the bowls and other ingredients next to the stove (this dish cooks quickly). 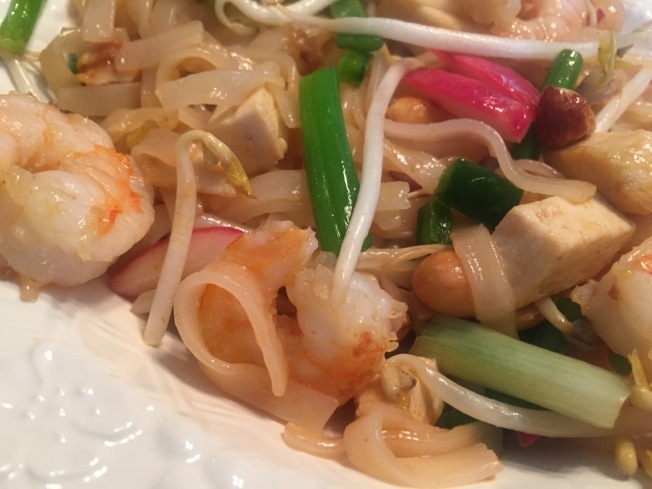 Heat a wok or large skillet over high heat until very hot. 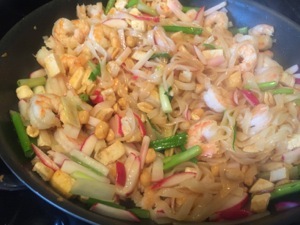 Add the vegetable oil, then add the shrimp and stir-fry until pink, about 2 minutes. 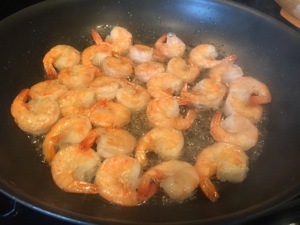 Transfer the shrimp to a bowl using a slotted spoon; leave the oil in the pan. 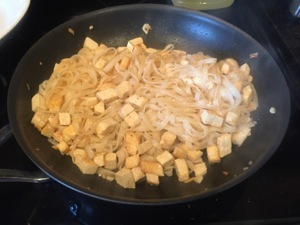 Add the garlic and tofu to the pan; stir-fry until just golden. 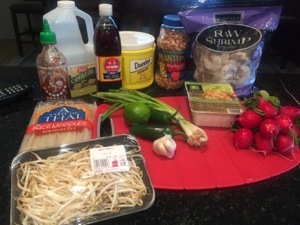 Add the noodles and 1/4 cup fish-sauce mixture; stir-fry until the noodles absorb the sauce, about 3 minutes. Add up to 1/4 cup water if the noodles seem dry, but don’t let them become mushy. Add the radishes, scallions and 1/4 cup peanuts; toss to combine. Stir in the remaining fish-sauce mixture. Taste and adjust seasoning (you can add more water, lime juice or fish sauce). Return the shrimp to the pan and heat through, about 2 minutes. 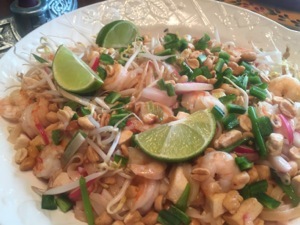 Transfer the mixture to a platter; top with bean sprouts, jalapenos and the remaining 1/4 cup peanuts. Serve with lime wedges. ← Fit for a Maestro!